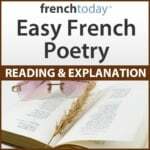 Click on the audio link below to listen to my slow and fast reading of this French poem. Forces you to bend your head. Braves the efforts of the tempest. For I would protect you from the storm. On the humid banks of the realms of the wind. Resisted without bowing your head. The worst child the North ever gave birth to. The tree held strong; the reed bent. And roots were touching the realms of the deads.